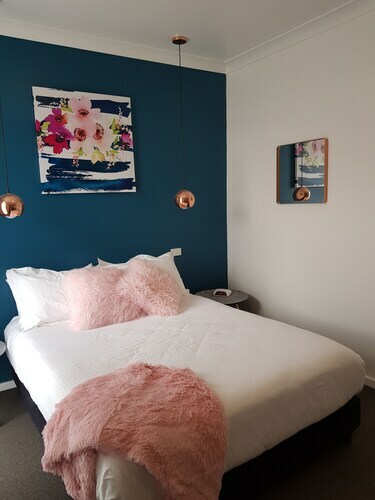 Situated in Young, this motel is 0.3 mi (0.4 km) from Young Visitor Information Centre and 2.4 mi (3.9 km) from Chalkers Crossing Vineyard and Olive Grove. Wotif doesn't have any hotel listings in Grenfell. About 40 kilometres from Grenfell is Cowra, which has a range of places to rest your head. Start with the Aalana Motor Inn and Country Comfort Cowra - Countryman Motor Inn. After you have spent some time in Grenfell, ensure you allow time to explore more of Central New South Wales. Central New South Wales boasts rural landscapes, as well as common Central New South Wales tourist destinations like the art museums and history museums. In this part of Australia, visitors might try hiking, horse riding and four-wheel driving. If you'd like to explore some nearby cities, try Forbes and Cootamundra. Travel 60 kilometres to the north of Grenfell and you'll locate Forbes. That said, Cootamundra is 85 kilometres to the south. Forbes accommodations include the Econo Lodge Ben Hall Motor Inn and Town & Country Motor Inn Forbes. Cootamundra choices include the Bradman Motor Inn and Cootamundra Heritage Motel. At Wotif, we live for travel! So when you're ready to hit the sights of Grenfell, we'd be honoured to take you there. How Much is a Hotel Room in Grenfell? Hotels in Grenfell start at AU$91 per night. Prices and availability subject to change. Additional terms may apply. The manager was very polite & helpful. The family room was comfortable and sleeps 5 no problem. Bathroom and kitchenette were basic but effective. Very friendly staff, breakfast was continental and in a good position in town.